OXFORD, Miss. 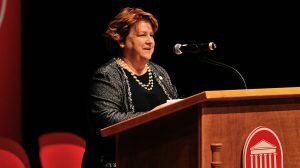 – After a nearly 40-year career with the University of Mississippi, Vice Chancellor Emerita of University Relations Alice Clark is being honored as the 2019 School of Pharmacy alumna of the year. Clark’s career at UM began at the School of Pharmacy as a graduate student in 1973 after completing her undergraduate work at Troy State University. After hearing about the School of Pharmacy’s pharmacognosy program from a recruiter, Clark found herself drawn to the interdisciplinary nature of pharmacognosy’s combination of chemistry and biology. After receiving her Ph.D. and completing a postdoctoral research associate position at the University of Texas, Clark returned to the Ole Miss pharmacy school as a faculty member. Upon her return, she was awarded one of the early contracts in AIDS studies by the National Institutes of Health to search for new antifungal agents and began a series of influential research projects that would continue throughout her career. When the School of Pharmacy created its National Center for Natural Products Research in 1995, Clark served as the center’s first director, cultivating relationships with other research centers, securing funding for research projects and directing the center’s faculty and staff. The center’s first associate director and, later, its second director, Larry Walker, worked closely with Clark during the first few years of the center’s existence. “Alice was an obvious choice to lead the natural products center because she had a well-developed, well-funded research program, and she knew about the types of efforts we wanted to launch initially in the NCNPR,” Walker said. Clark led NIH-funded research in antimicrobial and antifungal screening programs that led to discoveries of many new antifungal natural products. Some of her work also focused on antimalarial drugs, including primaquine, on which the School of Pharmacy is conducting clinical trials. After serving as the center’s director for more than five years, Clark was invited to join the university’s leadership as vice chancellor for research and sponsored programs in 2001. 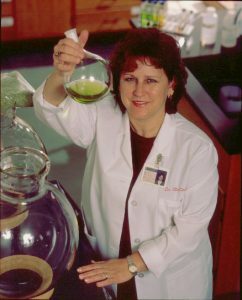 Walker credited Clark with playing a key role in amplifying the university’s reputation for excellence in pharmacognosy and natural products research, citing the caliber of her research and her leadership in national scientific organizations. “You couldn’t imagine any greater impact from a scientist here on the national front,” Walker said. As vice chancellor for research and sponsored programs, Clark was responsible for the university’s research activities, as well as its federal government relations and economic development. Working in the Lyceum also allowed Clark to apply her vision and leadership skills to universitywide projects, such as the conception of Insight Park, a research facility envisioned to support researchers across the university working with the private sector. 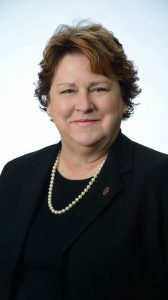 In 2016, she assumed the position of vice chancellor for university relations, overseeing development, public events and communications, before retiring in 2018. Robin Buchannon, associate vice chancellor emerita of university relations, worked with Clark in the Lyceum for 17 years. Together, they worked on obtaining an R1 research designation for the university within the Carnegie classification system. Clark also encouraged the professional development and credentialing of staff in the Office of Research and Sponsored Programs. David D. Allen, dean of the School of Pharmacy, called it the pharmacy school’s honor to name Clark alumna of the year. Clark will be honored Saturday (April 6) at the School of Pharmacy’s awards banquet and reunion dinner.